Phalanx (plural: phalanges) refers to the bones found in fingers, toes, paws, wings, hooves and fins of animals. These are long bones whose length exceeds their breadth. Phalanges are connected to each other at hinge-like inter phalangeal joints that can be used for either flexion or extension. Some phalanges are fused to each other. There are 56 phalanges in the human body, with the thumbs and large toes having 2 bones each. The remaining fingers and toes have 3 bones with the fourth and fifth toes having fused phalanges. This gives rise to the phalangeal formula of 2+3+3+3+3 bones per limb. Depending on their position, these bones are attached to the bones in the palm (metacarpals) and foot (metatarsals) through ligaments at the metacarpophalangeal and metatarsophalangeal joints. Tendons connect phalanges to muscles in the palm and forearm, which direct the movement of fingers. Similar attachments are seen for phalanges in the toes. The word phalanx derives from the Greek term for a military formation where soldiers stood in several rows and columns. Each digit has two or more bones and every palm or foot has multiple digits. When these bone structures are seen (as in an X-ray or a skeleton), it can appear as if the bones are arranged side-by-side, two or three rows deep, like an army formation. Phalanges can be classified based on their position relative to the rest of the body. The bone closest to the metacarpals and metatarsals is a proximal phalanx, while the one farthest away (usually positioned below the nail) is a distal phalanx. 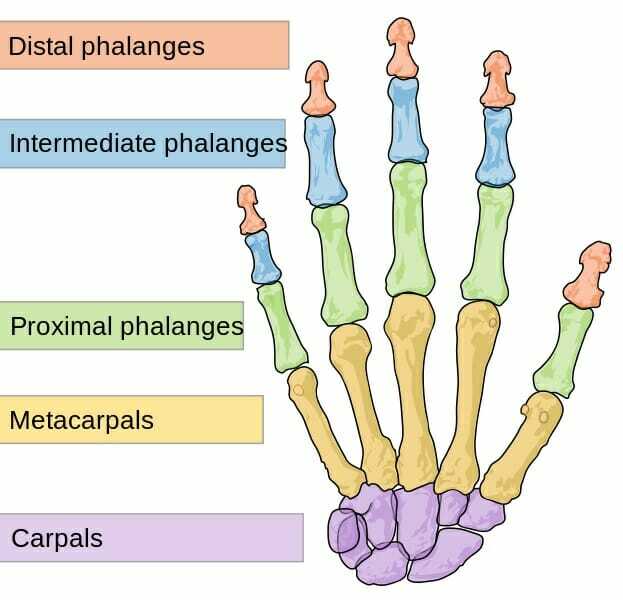 Some digits have more than two bones and those situated between the proximal and distal bones are called intermediate phalanges. While human fingers and toes have either 2 or 3 phalanx bones, there are primitive reptiles with 4 and some marine mammals can have up to 12 bones in a digit. These bones form the base of fingers and toes and connect them to the rest of the limb. These phalanges also form the knuckles of the hand. In mammals like bats, the proximal phalanx connects to the metacarpophalangeal joint to form the base of the wing. Depending on the function, these bones can vary in shape. In humans, the proximal phalanx in the hand is relatively broad with a concave surface near the palm. The corresponding bone in the foot appears shorter, with a convex surface above. In horses, the proximal phalanx is called the pastern and appears like an hourglass. It is nearly twice as long as the next intermediate phalanx. The position of the hoof during running, which depends on the nature of the surface, is supposed to affect the occurrence of fractures in these bones in racehorses. Proximal phalanges are also important in the study of fossils to understand locomotion patterns since they are the skeletal elements that are in close apposition with the substrate. Injuries to proximal phalanges include fractures and dislocations. They are usually treated with realignment under local anesthetic and a splint to immobilize the bone and joint. Intermediate phalanges are not present in every digit, and are missing from the thumb and large toe in humans. These bones are intermediate in position, length and size. They are a part of two inter phalangeal joints, interacting with the proximal and distal phalanx bones. In horses, intermediate or middle phalanx bones are called coronets and form the upper limit of the hoof. The shape and flexibility of this phalanx is important for animals like bats, where the bone has to bend and flex with the flow of air, rather than restricting its movement. Also known as terminal phalanges, these bones play a number of roles. They support the fleshy underside of fingertips in humans, which contain numerous nerve endings. Small, flat extensions from these bones called apical tufts are present underneath nails. A number of adaptations in the anatomy of the distal phalanx of the thumb are necessary for fine motor movement and for grasping objects. In large ungulates such as the giraffe, elongated, large distal phalanges are important in absorbing the stress from running. Similarly, arboreal mammals also have modified distal phalanges. Distal phalanx bones of the toes taper towards the outside, being broadest near the base next to the proximal phalanx. These bones form the structure of fingers and toes and are crucial for most of the evolutionary activity in hominid species. Tool making, precise gripping, grasping and handling of equipment arose due to anatomical features of the phalanges. The opposable thumb appeared due to the evolution of the tendon and ligament structure surrounding the bones. A number of adaptations in the anatomy of the distal phalanx of the thumb are necessary for fine motor movement. In other animals, phalanges are adapted for quick movement (horses and giraffes), for moving across a canopy (arboreal mammals), for flight (wings in bats, birds), for swimming (fins in aquatic species), and for hunting (claws and paws in carnivores). The evolution of mammals has given the phalangeal formula of 14 bones per limb. In many taxa, however, one or more fingers have lost their immediate function. Dogs, cats, cattle and many other hoofed animals have a reduced thumb that is called a dewclaw. This phalanx is not normally used during movement. Occasionally, dewclaws in animals like pigs come into contact with the ground. Reduction of the thumb is common among rats, mice, dormice, kangaroo rats, and squirrels. In some monkeys, such as the Colobus the thumb is vestigial. Many anteaters, armadillos and sloths have vestigial or missing phalanges. The giant armadillo and nine-banded armadillo have vestigial fifth fingers. In the arboreal three-toed sloth, two digits with their accompanying phalanges are not present since they are not important for the animal’s lifestyle. The giant anteater has a fifth finger with only 2 phalanges. In lesser anteaters and silky anteaters, the fifth finger has lost all its phalanges. Arboreal – Referring to organisms (esp. animals) that live on trees. Condyle – A spherical extension at the end of some bones that forms the interface with another bone. Digit – Derived from the Latin word ‘digitus’, it refers to structures found at the extremities of limbs, such as fingers, or toes. Vestigial – Parts of the body that have lost function over the course of evolution, though they are found as a crucial part of the body in other, related species. 1. How many phalanges are present in the large toe of primates? A is correct. While most fingers and toes of mammals have 3 phalanges, the thumbs and toes have only 2. The presence of 12 phalanges is only seen in crustacean flippers. 2. 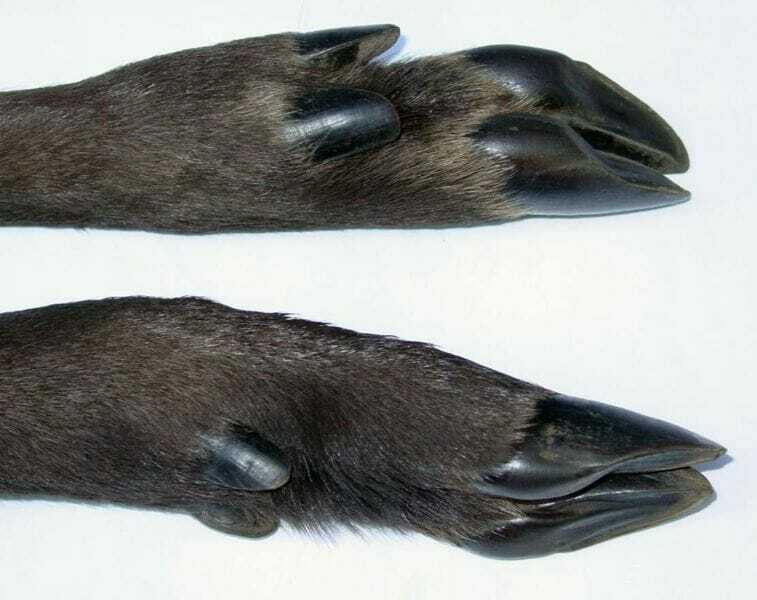 Which of these animals contains extremely long terminal phalanges? C is correct. Humans have rather small terminal phalanges. In spite of their long legs, giraffes do not particularly have long phalanges either. As hoofed animals, their distal phalanges are modified to be part of the hoof. The three-toed sloth, however, has evolved to be best suited for its arboreal lifestyle and this includes the presence of long distal phalanges. 3. Which of these animals are correctly paired with their vestigial phalanx? D is correct. Cats have a reduced fifth finger and toe that forms a dewclaw. Colobus monkeys have a vestigial thumb and the giant armadillo has a vestigial fifth finger.